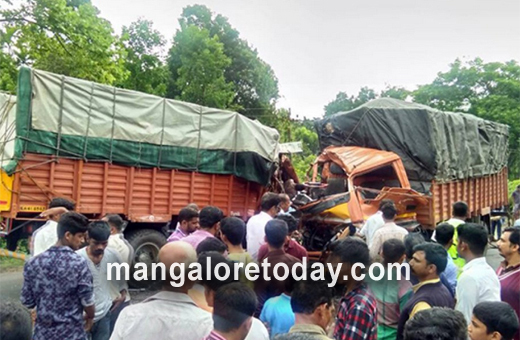 Uppinangady, May 21, 2017: A head-on collision between two Eicher lorries at Golithottu on the Mangaluru-Bengaluru National Highway on May 21, Sunday has claimed the lives of the drivers of the two lorries. If one driver lost his life on the spot another who was seriously injured died at a hospital in Mangaluru. The deceased have been identified as Manjunath (27), son of Kallappa of Shikaripura and Nagesh (22), son of Thoppayya, a resident of Nelamangala in Bengaluru. If one lorry was proceeding towards Mangaluru another had started its journey from Mangaluru. The impact of the collision was such that the front portions of both the vehicles were totally smashed and the drivers caught in between. A JCB had to be summoned to separate the lorries. Uppinangady police have visited the spot.